The Secretary of State said the new money was a "real help for Scotland at a time when parts of Europe are facing real crisis"
The Scottish Secretary Michael Moore said today’s Autumn Statement provides “real help for Scotland at a time when parts of Europe are facing real crisis”. Moore said that by sticking to the deficit reduction plan, the UK was avoiding the problems of some Eurozone countries and able to invest hundreds of millions of pounds extra in Scotland. 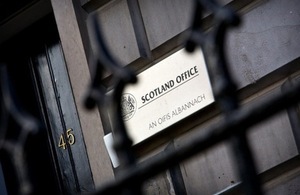 The Autumn Statement set out measures that will help pensioners, young unemployed and motorists in Scotland. On top of this, the Chancellor’s statement means that Scotland will receive an additional £433m in Barnett consequentials for capital projects which are vital for economic growth. This new money is in addition to the recent announcement of £100m for the Scottish Government to invest in renewable energy in Scotland and a further £200m in extra Barnett consequentials that have already been announced since last year’s Spending Review. “In tough economic times the UK is keeping the confidence of the markets, keeping mortgage rates down and finding ways to invest more in Scotland,” said Michael Moore. * The Youth Contract, which will see Government fund incentives for companies taking on young people, extra support from JobCentre Plus for unemployed 18-24 year olds and an offer of work experience or a sector based work academy place for every unemployed 18-24 year old who wants one. * The 3p fuel duty increase planned for January 2012 will be deferred. * The basic state pension increase will benefit 1 million Scottish pensioners. * The Government will make £50m available to enable the replacement of the cross-border Caledonian Sleeper fleet to improve on-train facilities. This exceptional funding is subject to the Scottish Government agreeing to co-fund the replacement programme. * Small and medium size Scottish companies will potentially also benefit from the credit easing measures announced today. * Investment in telecoms, including broadband, will improve coverage in the more rural parts of the UK. Edinburgh will also become one of 10 UK super-connected cities. “This Autumn statement comes at a difficult economic time. By sticking to our deficit reduction plan the UK has avoided the problems facing some Eurozone countries. “The measures announced by the UK Government today provide real help for Scotland at a time when parts of Europe are facing real crisis. In tough economic times the UK is keeping the confidence of the markets, keeping mortgage rates down and finding ways to invest more in Scotland. This clearly demonstrates the benefits to Scotland of being part of the UK. “The job of growing our economy falls to Scotland’s two governments. The UK has announced wide ranging measures to help Scottish companies access credit, to delay increases in fuel duty and to help the young unemployed in Scotland. We are also investing in broadband and increasing the state pension. This is just some of what we are doing to help Scotland.